An agreement has been brokered in Minsk to stop hostilities in Ukraine from Sunday. The deal was reached after marathon talks between the leaders of France, Germany, Russia and Ukraine, and signed by the Ukrainian rebels. “I believe we agreed on a big deal. We agreed to a ceasefire starting at 00:00 on February 15,” Russian President Vladimir Putin told the media after the talks were finished. "The main thing achieved is that from Saturday into Sunday there should be declared - without any conditions at all - a general ceasefire," Ukrainian President Petro Poroshenko told journalists in a separate statement. A compromise decision was taken over the disengagement line, which was the biggest stumbling block in the negotiation. According to the document, Kiev’s troops would pull back heavy weapons from the current frontline. The rebels would pull back from the line as it existed in September, when the previous ceasefire agreement was signed. The security zone separating the warring parties must be at least 50km wide for artillery over 100mm caliber, 70km for regular multiple rocket launchers and 100km for heavier weapons with a longer range, such as Tochka-U ballistic missiles, the document states. The weapons pullout must start on Sunday and be completed in no longer than 14 days. The OSCE is charged with implementing the ceasefire on the ground and will use its drone fleet and monitors to verify that both parties are sticking to the deal. The ceasefire deal provides for withdrawal of all "foreign troops, heavy weapons and mercenaries" from Ukraine under an OSCE monitoring. "Illegal armed groups" would be disarmed, but local authorities in the future would be allowed to have legal militia units. The agreement involves exchange of all prisoners, which is to be completed within 19 days. A general amnesty for the rebels would be declared by Kiev. The national government’s control over the borders between Donetsk and Lugansk Regions would be fully restored a day after municipal elections, which would be held in the regions as part of a profound constitutional reform. The legislation would include the right for language self-determination and trans-border ties with Russia, as well as the authority of the local governments to appoint local prosecutors and judges, the document states. Humanitarian and economic issues are also mentioned in the deal. Kiev would restore economic ties and social payments, which it cut in rebel-held areas, the document says. An international monitoring mechanism may be established for these payments. During the transition period an internationally-monitored mechanism for humanitarian aid to the regions affected by the war would be implemented, the document sates. He added that the ‘Normandy Four’ expect the parties involved in the conflict to show restraint even in the days before the ceasefire takes effect. The terms of the ceasefire are spelled out in a document signed by members of the so-called contact group, which includes representatives from the rebel forces, Kiev, Moscow and the Organization for Cooperation and Security in Europe, Putin said. 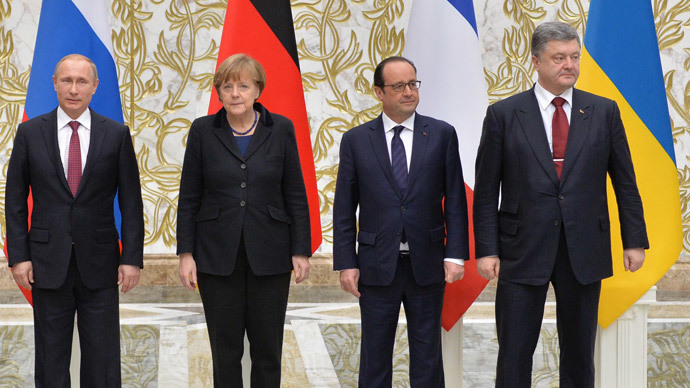 The members of the ‘Normandy Four’ – Putin, Ukrainian President Petro Poroshenko, German Chancellor Angela Merkel and French President Francois Hollande – supported a joint declaration describing the results of their work. The declaration was not meant to be signed by the leaders, Germany FM Frank-Walter Steinmeier said. The new Minsk accord gives hope for de-escalation of the Ukrainian conflict, although it would require a major effort to build trust between the parties involved. The previous deal collapsed as neither Kiev nor the rebels implemented it fully, which means the threat of renewed hostilities in Ukraine continue to loom.